I was watching one of her Christmas cookie specials, and she made Molasses Crisps that were rolled in sugar just before baking. I decided to do the same thing with the gingersnaps. It adds a lovely sparkle to the finished cookie and gives it a pretty 'crackled' look. Beautimous! So here they are. 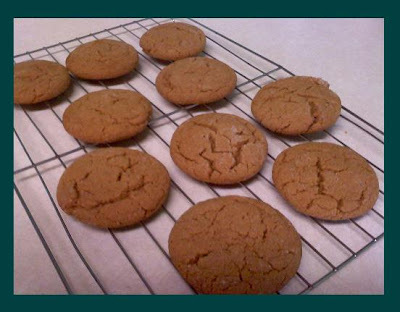 Mrs. Fields' gingersnaps, with a Martha touch. In a medium bowl combine flour, soda, salt, ginger, crystallized ginger, allspice and pepper. Mix well and set aside. In a large bowl, mix sugar and butter with an electric mixer set at medium speed. Scrape down sides of the bowl. Add egg and molasses, beat at medium speed until light and fluffy. Add the flour mixture and mix at low speed just until combined. Chill the dough in the refrigerator for 1 hour--the dough well be less sticky and easier to handle. Form dough into balls 1 inch in diameter. Place onto ungreased cookie sheets, 1 1/2 inches apart. Bake 24-25 minutes. Use a spatula to immediately transfer cookies to a cool, flat surface. I like a larger cookie, so I usually use about 2 tablespoons of dough for each one. Yes, that means less cookies per batch, but that's just an excuse to bake another batch! I like to use the Pampered Chef medium scoop to measure out my cookies. It just makes life SO much easier.